The post Glenfield Hospital Modular Wards appeared first on MTX Contracts Ltd. Following a demanding and fast-track pre-construction stage, MTX have been awarded a multi-million pound project to construct modular wards at Glenfield Hospital. The University Hospitals of Leicester NHS have a requirement to develop their existing site to create a new renal ward department at Glenfield Hospital. This work is integral to the trusts wider plans to further develop the City’s hospitals. MTX will provide a bespoke off-site solution which will be sited on top of the current hospital. To facilitate access two passenger lifts will be provided to transport patients from the existing hospital street to the new roof top facility. The new scheme will incorporate a 12 bed Renal Transplant Unit (RTU) and Hepato Pancreto Bilary Wards (HPB). The HPB will consist of a 24 bed Emergency Admissions Unit (EAU) and a 28 bed Elective Care Unit (ECU). It will also encompass a Nurse Base serving each ward, toilets, patient shower rooms, ancillary accommodation, an escape staircase serving each ward and 2 plantrooms equipped with specialist R.O Plant; necessary for patients receiving dialysis. An existing Estates Workshop on the ground floor was identified to be refurbished to house the R.O pipework. MTX are working in conjunction with their architectural partners IBI Group, consulting engineers DSSR and structural engineers Rossi Long to design a facility that will utilise the maximum space available on such a busy and condensed site. Enabling works have commenced onsite and practical completion is due early 2020. The post MTX complete A&E extension project at the Royal Bolton Hospital appeared first on MTX Contracts Ltd. The post MTX to complete further work at Luton and Dunstable University Hospital appeared first on MTX Contracts Ltd. The post Modular Orthopaedic Theatre for Guys Hospital appeared first on MTX Contracts Ltd.
Guys Hospital had a requirement for a new additional orthopaedic theatre and associated 4 bed recovery suite in order to allow for a greater patient intake. The new modular facility was delivered on 12th October 2018 and built onto a transfer deck at level 1 adjacent to the existing theatre department. The modular lift had to take place out of hours due to the busy and congested streets of London and the 24 hour nature of the hospital. To overcome this matter MTX hired 2 Site Teams to take it in turns to work 12 hour shifts throughout the night to oversee the install period. A road closure was put in place from 7pm on the Friday night and ran through to 9am the following Monday morning, therefore the MTX Teams had to work to a tight deadline to ensure all modules were safely in place before the roads were reopened. All first fix M&E has now been installed, all new plant has been fitted in the plantroom and the first coat of decorations have been applied. Works are on track to continue in the New Year with final fixes and finishes throughout January. Final commissioning throughout the month of February before official handover in March 2019. The post Royal Bolton Hospital Urology Modular Build appeared first on MTX Contracts Ltd. The post MTX win modular construction job at the Royal Bolton Hospital appeared first on MTX Contracts Ltd. The post Derriford Hospital Modular Heart Clinic appeared first on MTX Contracts Ltd. The aim of this scheme is to provide Derriford Hospital with a modular Heart Clinic to house all necessary lodgings including a cardiac catheterisation lab, 5 bed bay recovery, 5 seated recovery lounge and treatment rooms. The scope for the new facility is to ease the pressure off NHS waiting lists by enabling a quicker response to the demand of cardiac procedures across the South West. 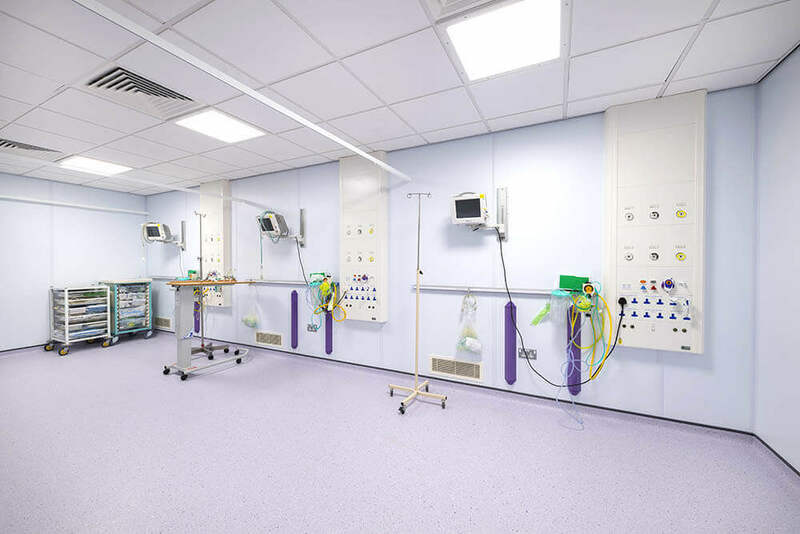 The post Wrexham Maelor Hospital Modular Twin Theatres and Endoscope Procedure Room appeared first on MTX Contracts Ltd. Founded in 1826, Wrexham Maelor Hospital houses 981 beds and has a catchment area of over half a million citizens. Before the amalgamation of North Wales Trusts in 2010, it was home to the North East Wales NHS Trust. Betsi Cadwaladwr University Healthboard required additional theatre capacity to Wrexham Maelor Hospital. The old theatre facility was in urgent need of modernisation. Further to the new theatre facility the Trust also identified that an additional Endoscope Procedure Room was required. Our Design Team, working in collaboration with the Trust, produced a new modular 2 storey scheme linked to the main hospital street corridor. The bespoke external building is positioned on pad foundations designed to suit the ground conditions. The new construction has two floor types, timber and concrete floors complying with Health Technical Memoranda. The ground floor is made up of 31 modules providing 751m² of space. It comprises of two Operating Theatres, Endoscope Procedure Room with Admission Room, 2nr Recovery Wards, Anaesthetic Room, Nurse Base, Staff Room, Scrub Up, Prep Room, Staff Shower Rooms, Toilets, Waiting Area, Changing Rooms and Endoscope Cleaning and Drying Rooms. The top floor is dedicated to house the 2 plantrooms; 1 serving the Endoscope and Recovery areas and the other serving the Operating Theatres. The internal design and colour scheme was chosen based on previous MTX Endoscopy projects and the hospital’s current decor. The Trust were impressed with the fresh and modern finish on the MTX projects, however were keen to keep in line with their existing trend, therefore a mixture of the two was decided. The Surgeon Panels, IPS and UPS are all provided by Bender UK and Dextra provided the eco-friendly LED lighting, used throughout the whole project. Whilst putting this project out to tender, the Trust had to hire mobile Operating Theatres in the interim in order to pacify the ongoing patient demand. These were in place since winter 2017 and consequently MTX were working to a strict programme timescale to ensure that the mobile units were onsite for as little time as possible. Capital cost was also a key consideration for this scheme. Following a number of value engineering options, ranging from external finishes to mechanical engineering solutions, offered by our team and accepted by the Trust, we were able to meet their budget. The design and procurement process was critical with a challenging onsite construction period ahead. During the site survey, it was realised that the route included a weak bridge which the wagons were unable to cross. Therefore the team had to determine alternative temporary access which involved removing part of metal fencing bordering an adjacent supermarket car park and closing this area off to the public. The wagons were then able to access the site via the supermarket car park and through the opened fencing. Once the modules were all successfully installed, the fencing was reinstated and the car park reopened. The post MTX win place on Fusion21 Modular Building Framework appeared first on MTX Contracts Ltd.
Fusion21 formed the new division of the framework, specifically created for the education industry, blue lights buildings, general public buildings and leisure facilities. Following a competitive tender it was announced that MTX were successful and now become part of the £400 million framework, providing fully OJEU compliant permanent and temporary modular solutions to the education and healthcare sectors, having been a trusted partner to the NHS for over 20 years. Nick Verburg- Procurement and Supply Chain Manager for Fusion21. The post MTX Commence a Modular Heart Clinic for Regent’s Park Healthcare appeared first on MTX Contracts Ltd.
University Hospitals Plymouth NHS Trust (UHP) have formed a joint venture with Regent’s Park Healthcare Ltd., a specialist cardiology services company, to develop and operate a state-of-the-art heart centre to be called the ‘Peninsula Heart Clinic’. Peninsula Heart Clinic will provide UHP with more capacity to reduce NHS waiting lists and respond to the burgeoning demand of both cardiac procedures and outpatient diagnostics across Plymouth and the wider South West region. MTX have begun works onsite to provide a modular standalone building situated at the rear of the hospital with easy access to the car park. The new single storey clinic will be built on pad foundations and will comprise of the following areas: cardiac catheterisation lab, 5 bay bed recovery, 5 seated recovery lounge, 3 single ensuite rooms, outpatient centre with waiting area and treatment rooms, staff changing facilities, staff restroom and offices. Works are due to be completed late 2018.